Industry Expert Roundup: Why Are Events Important? Events are among the most effective tactics used by both the B2B and B2C industries alike. In fact, Eventtrack industry research revealed that 74 percent of attendees have a more positive perception of an organization after an event and 96 percent of consumers who have a great experience at an event will be more inclined to purchase. The effectiveness of events as a marketing and sales tool is not up for question. What many have wondered, however, is “why.” Why are events so important? Why are marketers spending more on them, and reshuffling budgets and staff to ensure they take place? To get to the bottom of this, Localist reached out to some top agencies in the experiential marketing field, asking them to answer one question: “Why are events important?” The question was the same across respondents, but their answers were anything but! Take a look at their responses below to get a better sense of why events are important in today’s experiential environment. It’s a well-known fact that events are the best way to establish personal connections with not only your target audience but also your potential partners, sponsors, etc. Events are an effective way for businesses to build trust, form an emotional connection, and finally have a chance to stand out from its numerous competitors. However, before attending or organizing such events, you need to be prepared. This means that you should know your target audience first. In this way, you’ll deeply understand your prospects’ needs and requirements. For example, what are the business problems they face? How can you help them solve the issue? With this in mind, you can get a more satisfactory outcome from the event. Events are important because they allow for a more intimate and engaging experience with your audience which ultimately leaves a lasting impression and one that is more memorable than a passive viewing of a more traditional form of advertising. Events come in all shapes and sizes but the ability to interact one-on-one with a brand, environment, product etc. is unique to events and the reason I feel they are such an important medium of advertising and the future of brand marketing. Events and experiential allow for the opportunity for brand or product to connect with people and show how it can be part of a person's life. Whether the person's experience is speaking to a brand ambassador or actually trying out a product first hand, this interaction creates a deeper and more personal connection than if they just saw an ad on a screen. If this person had a great 2 minute experience, they'll feel more inclined to make this brand or product part of their daily life. Human interaction is at the core of a brand conversion experience. In a day and age when the digital world is at your fingertips it's easy to lose consumers in the chaos of mass communication and transactional advertising. Events serve as the purest form of authentic brand engagement and have the power to shift a consumer from a naysayer to passionate brand evangelist. Today, consumers expect and demand genuine connections with brands—they are no longer passive recipients and believers of brand messaging. Through events and experiential marketing, brands have the opportunity to emotionally and physically connect with their audiences. And now, events and experiences are no longer bound by the physical spaces of an activation; through social shares, live streams and interactive media, we can reach audiences on a global scale. When a brand’s message is shared by a friend, a family member or a colleague, it becomes more credible, more authentic, and more impactful. The power of one-sided mass advertising is waning in the era of authenticity and customization. Event marketing facilitates customer engagement with brands in a meaningful and multi-sensory way, building a strong, memorable emotional connection between brands and audiences. Additionally, live experiences are invaluable opportunities for content generation and data collection to inform future campaigns. Physical events allow brands to connect with consumers in an intimate and meaningful way that is hard to match in the digital space. Both are important to an integrated marketing strategy, but now more than ever consumers seek “experiences” over materials. Events provide a unique platform for consumers to fully immerse themselves in a brand, evoking an emotional connection that leaves a strong, lasting impression. Events today are a critical component of any marketing mix. 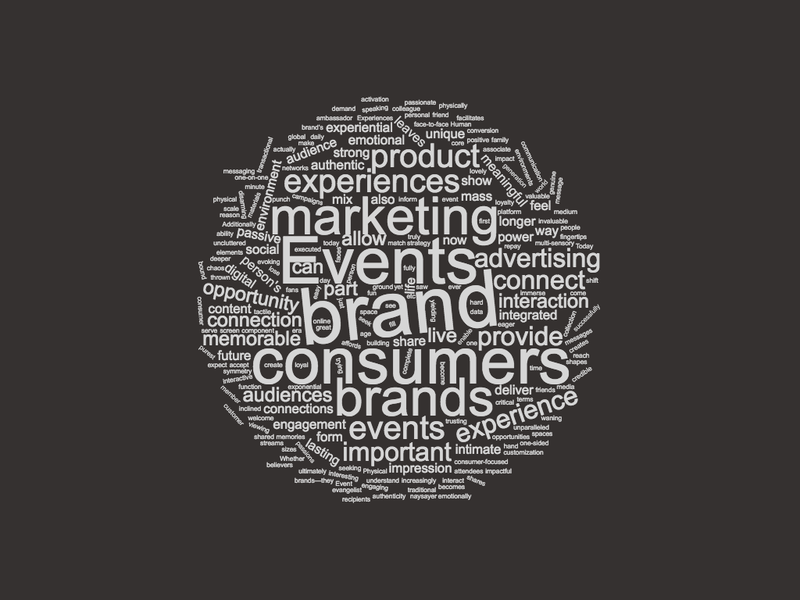 Events enable brands to connect live with their audience on the ground while also yielding content that affords exponential connections online. When executed successfully, they truly deliver a 1-2 punch that is unparalleled in terms of impact. Events show consumers that brands see them, understand them, and share their passions. Experiences create consumer-focused environments that are interesting yet disarming — in which attendees accept, and welcome, marketing messages because they're integrated into a fun time, not thrown in their faces. When consumers associate a brand with the positive memories of their event, they become loyal, trusting fans eager to share with their friends and social networks. As part of the complete marketing mix, events fill a very important ‘tactile’ function that other marketing elements cannot deliver. Events provide brands the opportunity for product interaction in an uncluttered face-to-face environment. Events also provide consumers with the experiences that they are increasingly seeking. When brands can provide consumers with these valuable and memorable experiences, consumers repay them with brand loyalty – a lovely symmetry.